Federico Fellini injected himself into a lot of his films, exploring his memories and dreams, psychoanalysing himself through the medium of cinema. Juliet of the Spirits, which came after possibly his most autobiographical film, 8 1/2, is an interesting spin on this idea though. Rather than delve into his own psyche, the film explores Fellini’s interpretation of that of his wife Giulietta Masina. Juliet of the Spirits was written for and stars her, seemingly playing this version of herself. It’s a strange kind of love letter to his wife perhaps, although Masina supposedly wasn’t totally enamoured with how she was written and portrayed. She went through with it though and it did no harm to their marriage (which had its share of ups and downs), as they stayed together right to the end. In fact they died only a few months apart. 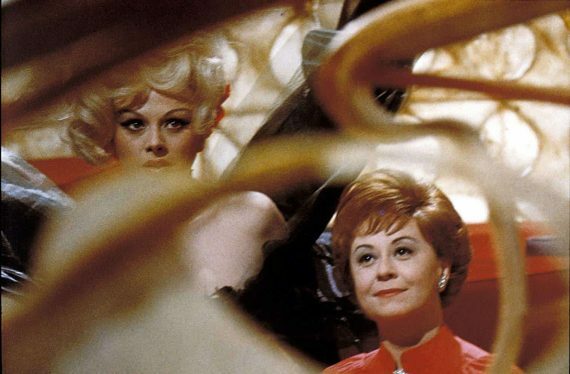 I must admit I haven’t seen many of Fellini’s films, but I have seen 8 1/2, which is a nice partner-piece to this, and liked it a lot, although it was a little too long and rambling to fall totally in love with. I’ve also seen La Dolce Vita, where the length was more of a problem and I struggled to stay engaged with its story and message, which I found quite slight. 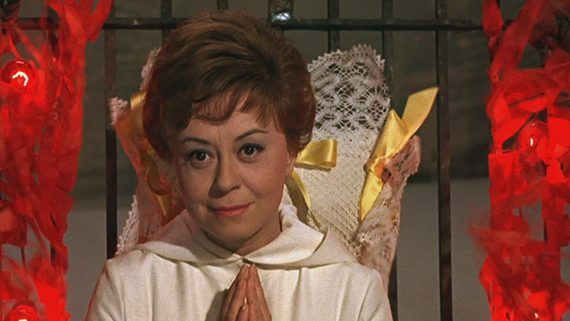 Both films, length aside, are filled with incredible imagery and wonderfully directed sequences though, so I was enthusiastic about delving further into Fellini’s career when a screener for Juliet of the Spirits was offered up. Looking at the two and a quarter hour running time, I was worried about the film being a bit of a slog again though, so I came in with some hesitancy. Juliet of the Spirits sees the titular character Juliet (Masina) as an unhappy wife to a husband (Mario Pisu) who doesn’t give her the care and attention he used to or should. He forgets their anniversary at the start of the film and all the spark has gone from their love life (he sleeps with earplugs and a facemask whilst she reads). Juliet, who is in her 40s, is starting to worry about the affects of ageing too, fearing she is getting old and past it. Her troubles then reach a new low when she discovers more than a few hints that her husband is cheating on her. After a seance with friends one night, where Juliet is singled out by the spirits, she is haunted by visions and memories that explore her issues and meets (possibly imaginary) characters who help tackle them. Visiting a mystical guru, a psychoanalyst and a sexually liberated nymphet among other oddballs, Juliet and the film itself explores different ways of picking apart the subconscious as well as examining femininity in general. It’s a film that could possibly be classed as a feminist work in this way, although coming from a male writer and director, this is questionable, as his view may be skewed and possibly idealised in places. Nevertheless, this is a very female-centric film and men play only a small part (on screen at least – Juliet’s relationship with her husband is of course pivotal), so it’s still an admirable work with regards to women on screen. It’s interesting to see how men are portrayed here too, particularly as this can be seen as an autobiographical work. 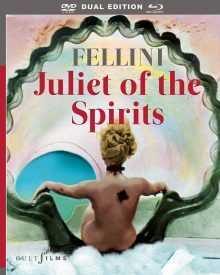 If Fellini himself is supposed to be Juliet’s husband in the film, he doesn’t come across very well. So perhaps Juliet of the Spirits is his way of apologising to Masini for his infidelities (which he openly admitted to) and poor treatment. Fellini may possibly see himself instead as the ideal man, Jose (José Luis de Vilallonga) though, who enters the film later on and Juliet becomes enamoured with. Or perhaps more likely both characters come from his view of himself. So, particularly if you are aware of its background, there’s a lot of food for thought in this fascinating film that, on the surface at least, seems fairly slight. Indeed the story itself is very simple – a woman is worried about growing old and is fed up of her unfaithful husband so thinks about whether to leave him or have an affair herself. It’s pretty bog standard when you put it like that, but Fellini’s approach is anything but. For one, he creates a wild, circus like atmosphere that can be seen in some of his other films. There is so much activity on screen and movement that you get swept away by it and, like Juliet, get overwhelmed at times, which leads to a liberating yet refreshingly open-ended finale. Masina helps ground the film with a wonderful lead performance. Her beautifully expressive face describes her true emotions as she politely hides her feelings on the surface to the characters surrounding her. With all the outlandish madness going on around her, Juliet’s issues feel very real and relatable, keeping the film from going off the rails, and Masina helps achieve this. Also marking the film out is its visual style. 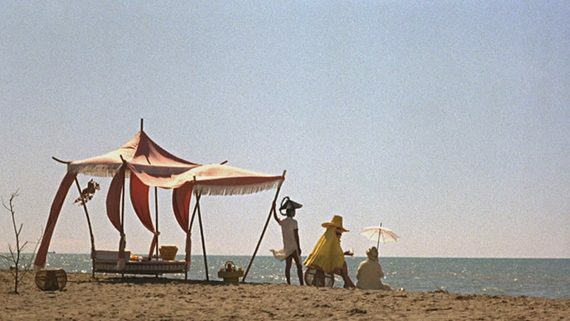 This was Fellini’s first feature shot entirely in colour and he truly goes to town with the format. It’s a positive explosion of bold colours, gloriously lavish production design and elaborate costumes. The film is utterly joyous to behold in terms of style. You could say it looks a little dated perhaps and certainly over the top, but it’s hard not to admire the way it brims with life and colour. On the downside, it still feels overlong so gets a little patience-testing at times, but it’s endlessly lively, strikingly stylised and colourful, yet has a relatable core holding it all together. With a captivating central performance among the madness, it’s masterfully controlled chaos from Fellini that’s a pleasure to get caught up in. Juliet of the Spirits is out on 24th September on dual format Blu Ray and DVD in the UK, released by Cult Films. I saw the Blu-Ray version and the film looks and sounds great. The colours are strong and the print is detailed and free of damage. These two features are superb, particularly the commentary which is crammed with thoughtful insights into the film.